This hot caprese dip recipe is a summertime winner – it will be your new go-to for summer entertaining (or year-round if you can find good basil!). 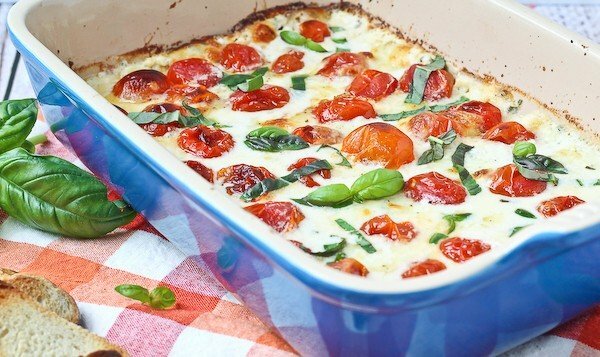 Confession: I could eat this entire dish of hot caprese dip. It’s…dangerous. I’m the first to admit that I know my shortcomings and my weaknesses. It’s a good characteristic to have, you know. Admit your weaknesses so that you can be proactive and avoid them. Well, one of my weaknesses just so happens to be hot, melty, cheese. I know, rare and unusual, right? I’m sure not a single one of you shares that weakness. I’m sure I’m the only one that goes back for “just one more bite,” a thousand times over again. So, you see…I knew this recipe was on my to-do list to develop. What’s a girl to do with summer around the corner? I can’t chow down the whole dish and still look cute in my summer clothes (I have a hard enough time as it is!). I took a look at my calendar and saw that my parents were coming to visit. We have a solution. My mom helps me cook AND the whole fam helps me eat. Winner winner caprese dinner dip. 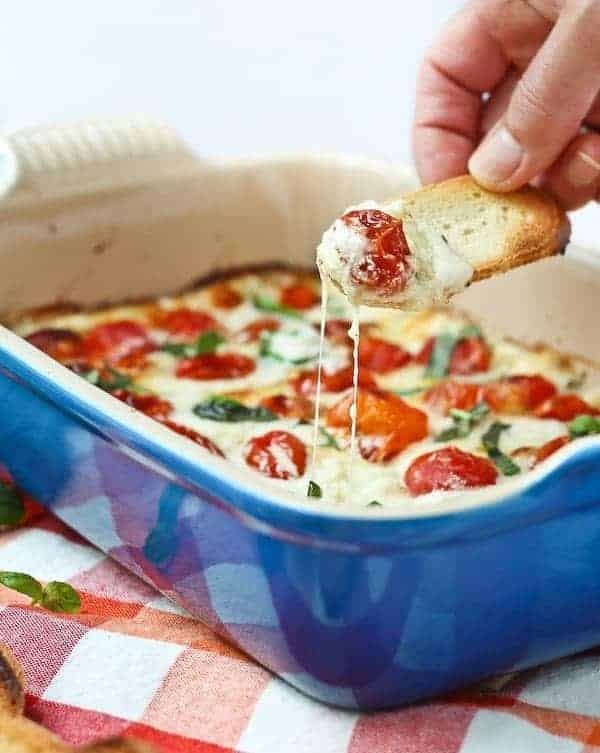 This addicting hot caprese dip recipe starts off with a layer of creamy cream cheese mixed with shredded mozzarella and fresh basil. Annnnnnyyywayyys…that creamy cream cheese layer is topped with plenty of fresh tomatoes and fresh mozzarella. That’s right – lots of cheese. Is there any other way? You know I love a good quinoa salad and smoothie but there’s nothing better than ooey, gooey, melted cheese. It’s the stuff dreams are made of. If you’re like me and can’t get enough, try white queso in the slow cooker! No velveeta, but plenty of dippable cheese. 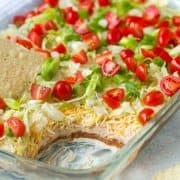 A couple more winners that are a similar these to the white queso are Mexican Spinach Dip or Healthy Queso Dip (that one has a secret healthy ingredient). Top this with some fresh basil and you’re ready to enjoy. Don’t get carried away though – make sure to let it cool down for a few minutes prior to digging in or those tomatoes will explode like hot lava bombs in your mouth and you’ll end up with a serious burn. And then you’ll do it again because it tastes so good. Don’t ask me how I know. If you want to see the cheesy goodness in action, make sure to watch the video! 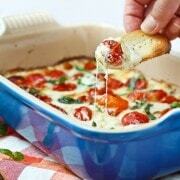 In a mixing bowl, combine cream cheese, mozzarella, chopped basil, and pepper. Spread into bottom of prepared baking dish. Layer on grape tomatoes and then fresh mozzarella. Sprinkle with more pepper if desired. Bake for 25-30 minutes or until heated through and bubbling and tomatoes start to burst. Let stand for 10 minutes and then serve topped with additional fresh basil. Difficulty: Easy. Unless we’re talking about portion-control. That’s not so easy. It’s almost as difficult with this pepperoni pizza dip. Craving more delectable dips? 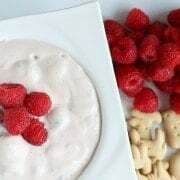 Try: Broccoli and Bacon Beer Cheese Dip, Vanilla Bean Yogurt Dip, Hummus Spinach Artichoke Dip, Cheddar Leek Dip, Roasted Cauliflower and Cheddar Dip, Stovetop Spinach with Sundried Tomatoes or Roasted Garlic Bean Dip. Oh yeah and of course I have a Pinterest board devoted to the subject. Clearly. Great recipe! It was easy to make and a hit of our party! I’m so happy to hear that! Thanks for taking the time to come back and leave a comment, Cathy! 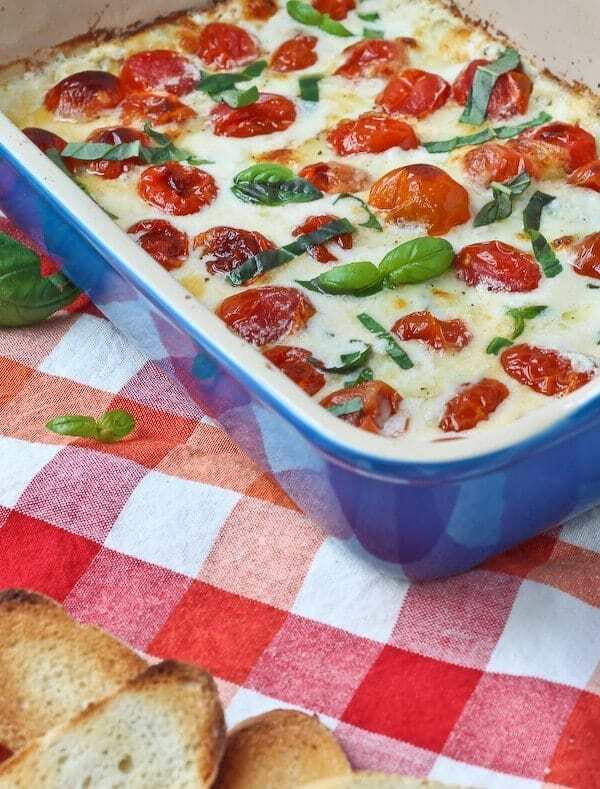 We have a similar dip that utilizes pesto with the mozzarella and tomatoes. Always a hit! Love this version too! 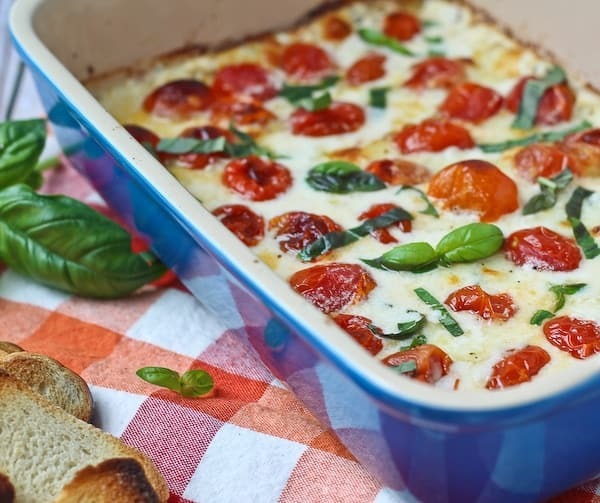 It’s the perfect time of year for basil and tomatoes! Would you think a small bit of garlic would be a negative impact on this dip? I’m a garlic addict but I’m making this for a group & I’d hate to ruin it. Thanks! I think that would be a fantastic addition! My husband is not a garlic fan so I often shy away from it. 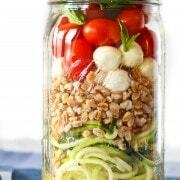 A little bit will definitely go a long way and make sure to mince it finely (or better yet, grate it with a microplane or use a garlic press if you have one). That will prevent anyone from getting a large bite of garlic since it won’t be sautéed first. Hope the dip is a hit! What exactly do you mean by “dried” for the fresh mozzarella? Are we just draining it in a colander? Or is it more involved than that? I appreciated your side note on the cream cheese, because I admit that’s where my warning flags went up. Thanks for letting us know that you gave it some consideration! Yep, just in a colander and then pat it dry with paper towel. Thanks for the nice comment! I hope you love the dip! Awesome. Wonder if it would be too much to have this for an appetizer and have Whole Foods handmade caprese sausage with pasta for the main course? They only make the sausage at this time of the year. There’s no such thing as too much caprese. :) Sounds like I need to make a trip to Whole Foods! Two questions….I have no grape or cherries but a lot on other tomatoes growing in the garden. Can I sub? Can left overs be had cold or does it need reheating. Thanks. This looks soooooo amazing! It should work just fine with any kind of tomato, it might just be a little juicier – I would recommend seeding them a bit before adding them. I have never tried leftovers cold, but hey, why not! ;) Otherwise just warm it up a bit in the microwave until it is melty again. Um….it’s wrong to say I LOVE YOU to a complete stranger. But…I LOVE YOU for introducing me to this recipe!!! IT ROCKS!!! Did you make this in a 9×13? Planning to make this for a party for a friend. I have waaay too much basil! My pan was smaller than a 9×13 – I think a 9×13 might work but you’d have to spread the cream cheese mixture out more and that might be tricky. It would be great doubled and put in a 9×13! This looks to die for, Rachel. Perfect party appetizer! Good compromise :) I also have a creamy, decadent dip to photograph soon, and I timed it right before my parents come up to celebrate my Dad’s birthday. Here you go Dad – DIPPPP! I just love that you kept the tomatoes whole for this! I love how deeply flavorful they get when they are roasted. And who can resist that mozzarella? oooh, this is my kinda dip! Cheesy-gooey-goodness! I love the cream cheese addition. Why not drizzle some balsamic vinegar on top? My brother wouldn’t like the cream cheese–he considers himself to be a caprese aficionado after living in Italy. He grudgingly shared his “secret” recipe with me. He’d add a bit of vino, though, to yours. This recipe is my love language!!! Gotta go get the ingredients so I can make it! Nothing beats a caprese salad in the summer….except maybe this dip. So much yum. caprese dip is so good! i love the idea of this hot version. yum! Holy magical dish of cheesy goodness. I want it all in my belly. Cream cheese based dips are always a win for me, but even more so being a caprese dip! I definitely want this in my life! I love everything caprese! So fabulous! ANY type of cheese is totally a weakness for me. But this looks beyond delicious… It would be dangerous to leave me alone with this! This makes me so excited for tomato and basil season!!! Tell Bonnie I said Hi! Is it wrong that I want to risk burning my face off, and just faceplant right into this dip? Caprese is my favorite and this looks AMAZING! Pinned! I am pretty sure this is what my heaven looks like. I love everything about caprese (even posted a salad of it today!) and this dip is a must of us!